PROVIDENCE – Mayor David N. Cicilline will host the second annual Senator Claiborne Pell Lecture on Arts and Humanities on Tuesday, March 9 at 7pm at Trinity Repertory Company. Mayor Cicilline established the annual symposium in honor of the late Senator for his extraordinary work championing education, the arts and humanities. The symposium, Cities, Bicycles and the Future of Getting Around, will explore how bicycling can transform the urban experience by raising the following questions for discussion: How do creative thinkers strengthen civic life? How can a city foster a more bicycle-friendly environment? How might Providence change if more people made a bicycle their primary mode of transportation? 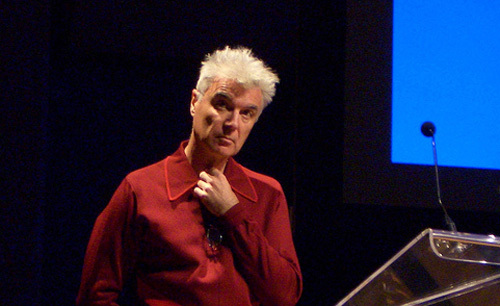 David Byrne has been writing and performing music and directing video and film for more than 30 years. He was lead singer and guitar player for the innovative rock band Talking Heads, who were inducted into the Rock and Roll Hall of Fame in 2002. What might not be as well known is Byrne’s longtime passion for biking and advocacy for bicycles in cities. Byrne has traveled New York City’s streets on a bike since the early 1980s, and often brings a folding bike on tour. His latest book explores this topic; Bicycle Diaries is an account of his urban bicycle odyssey through the streets of Istanbul, Buenos Aires, London, Berlin, Paris, Belgrade, Sydney, Manila, New York and San Francisco. Bicycle Diaries features beautiful photography, personal anecdotes from Byrne’s wide travels and a strong argument for the way a bicycle can change our view of the world and the city in which we live. Samuel Zipp is an urban historian who studies the cultural and intellectual history of 20th century cities. He teaches American Studies and Urban Studies at Brown University. He earned his Ph.D. in American Studies from Yale University. His book, Manhattan Projects: The Rise and Fall of Urban Renewal in Cold War New York, will be published by Oxford University Press this spring. Zipp’s interest in cities really took hold through a job as a bike messenger. He says traveling along the San Francisco streets by bike gave him a real appreciation for urban geography and the need to learn a city’s social, political, and economic structure from the inside out. Zipp’s presentation will explore the place of bicycles in the history of city development and urban renewal. Thomas Deller is a civic leader with first-hand experience creating infrastructure needed for bicycles in Providence. During his tenure as Director of Planning and Development for the City of Providence Deller has overseen the implementation of the Providence Bicycle Network and Providence Tomorrow, the city’s comprehensive plan, which contains many progressive policies regarding biking. As part of changes related to the I-195 highway move, Deller is working with local, state and federal partners to make way for bicycles in the Jewelry District. Deller’s experience in Planning and Urban Development dates back to 1979, when he began his career as a Planner in the East Providence Planning Department. He holds a Masters Degree in Community Planning and a Bachelor’s Degree in Urban Studies from the University of Rhode Island. The Senator Claiborne Pell Lecture on Arts and Humanities is a free but ticketed event. Tickets will be available beginning Thursday, February 25th at the Trinity Repertory Company box office, 201 Washington Street, and must be picked up in person (no phone reservations). Four ticket limit per person. Due to limited availability we suggest advance pick-up. For box office hours and directions, call 401-351-4242. For more information on the lecture, contact (401) 421-2489 x456 or visit creativeprov.org. Initiated by Mayor Cicilline in 2009, the annual lecture honors the late Claiborne Pell (1918-2009), who represented Rhode Island in the United States Senate from 1961-1997. Senator Pell is best remembered for being a champion of education, the arts and the humanities. He was the main sponsor of the Pell Grant, a financial aid program for U.S. college students, and he played a major role in the establishment of the National Endowment for the Arts and the National Endowment of the Humanities. If you haven’t got your tickets for this yet, you better hurry up. I just picked up some tickets and all they have left is General Admission. You have to go to the Trinity Rep Box Office in person to get your tickets. Limit 4 per person.